Oh summer, how boring you are, with nothing to offer on television but reruns. For some reason I'm stuck in the rerun doldrums early this year. Last night I found myself trolling around YouTube looking for a clip of the Family Guy "ad" for Wacky Waving Inflatable Arm Flailing Tube Man. 1. WACKY WAVING INFLATABLE ARM FLAILING TUBE MAN! "Something, Something, Something, Dark Side"
Any given episode of Venture Brothers has at least one Star Wars reference, and I remember listening to a podcast (was it an episode of "The Sound of Young America"?) where the creators talked about the art and science of making a Star Wars joke. 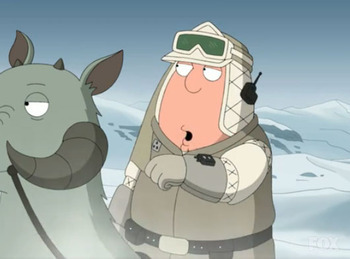 They pretty explicitly called out Family Guy, saying "You can't just say "STAR WARS!" and call it a Star Wars joke." Read more about "Something, Something, Something, Dark Side"
Family Guy Episode "The Splendid Source"
This is one of the few Family Guy episodes without any secondary or sub-plots, and it did adequately well for itself for the first two acts. Unfortunately the plot collapsed in the third act, and the episode as a whole compares unfavorably with similar episodes on other shows. But overall, it was certainly watchable enough. 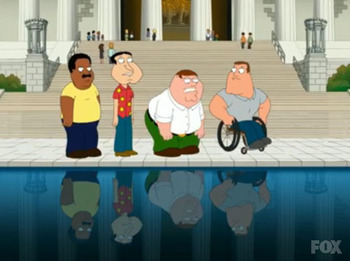 Read more about Family Guy Episode "The Splendid Source"
If I ever had any doubt that "Family Guy" is pandering to the frat boy crowd, "Quagmire's Dad" quashed those doubts. 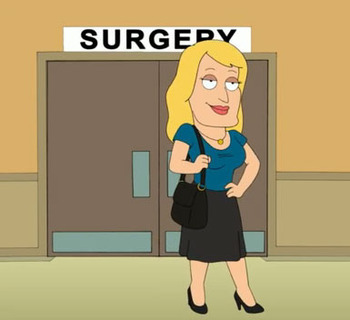 In a nutshell, Quagmire's dad turns into a woman, and everyone is disgusted. Because that kind of thing is SO SICK AND WRONG, amirite? Well, it is if you're a narrow-minded frat boy. And if you are, then you will have thought this Sunday's episode was a laff riot. Read more about "Quagmire's Dad"
Read more about "Brian and Stewie"
"Brian and Stewie" is that rarest of Family Guy episodes, where cheap humor and tired gags are replaced by witty dialog and a legitimately interesting story. 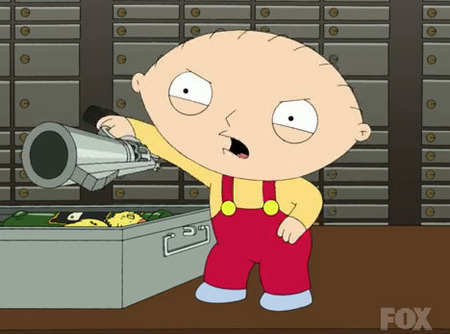 Given how formulaic the series has become in recent times, "Brian and Stewie" may not return Family Guy to its days of glory, but it's a relief to see that Seth MacFarlane can still write genuinely good television on occasion, and leave us with an offering that remains in memory long beyond the credits. And for good reasons, to boot.